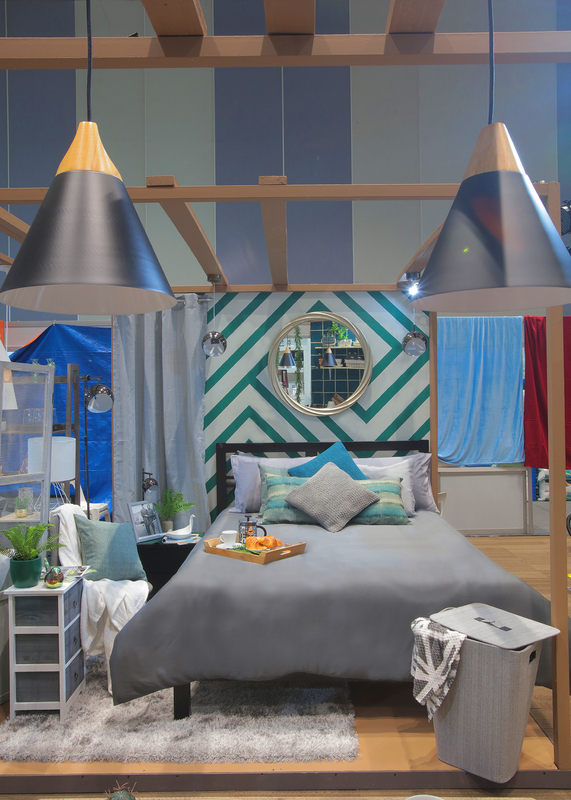 Last April 27 to 29 during the SM Home Turnover Fair in SM Aura, assistant vice president Tom Castañeda together with three other designers made room vignettes using colors mixed by Boysen exclusively for SM Home. But Tom and his team were restrained by choosing the light neutrals and greens to paint the walls. leaving out the warm orange Summer Solstice and intense yellow Flaxen. This makes a lot of sense when you are choosing colors for a small condo. 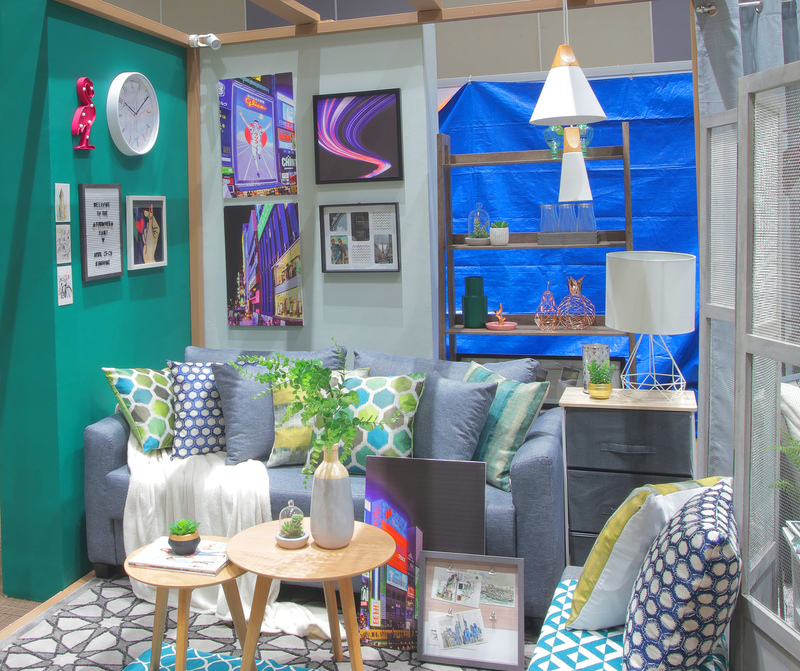 You wouldn’t want to overpower a small space, especially if it is a studio, with so many colors. It’s better to have a home that soothes you with cool colors rather than fire you up. Imagine coming home to that after a long, hard day at work? Nah, right! For the bedroom vignette, Tom chose the rich green color of Woodlands combined with the light grey of Stone to make striped patterns on a funky wall. A gleam of silver can be seen around the bedroom, in the mirror frame, the hanging lamps, even the cafetière on a wooden tray on the bed. With that you can already picture a much-deserved Sunday morning lolling around in bed, having a croissant while reading a book. Anyway enough of my neurotic ways and watch what Tom did to his bedroom space. If Tom’s bedroom was designed with restful woodlands and stone in mind, Tala chose the blue green of the Aegean Sea for that invigorating vibe, perfect for breakfast her favorite meal of the day. She focused on the grid and added wood tones for the organic feel, and the dull gleam of metal for a hint of the industrial style. Curated pieces for the decor were white dishes, silverware and wooden accessories. There’s a lesson right here. It would help to know yourself and what your needs are then decorate your own home accordingly. 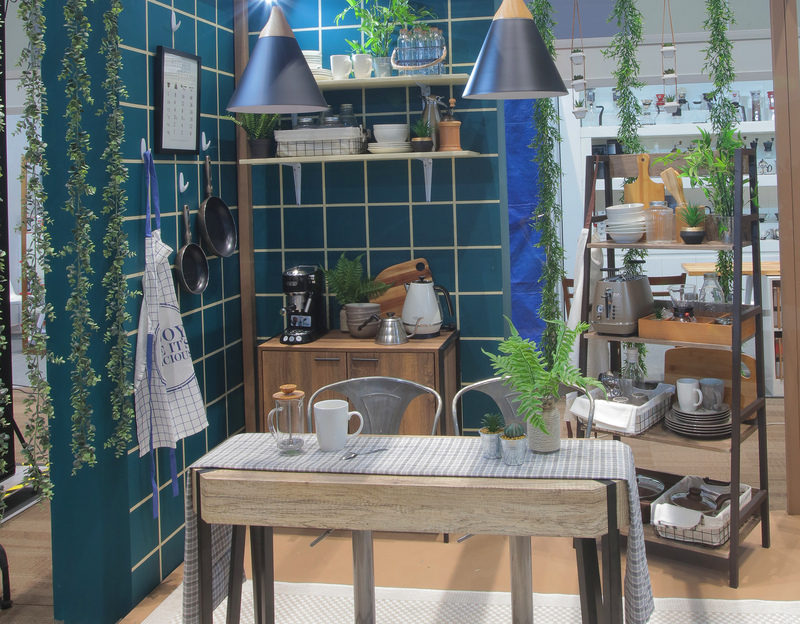 Watch Tala talk about her kitchen vignette. Dagny designed a tranquil dining room using the paints Woodlands and Fine Sand. She added a cool blue to complement the wall colors, and used different shades of light wood for the furniture, imparting a hint of the trendy Scandinavian look. Graphic organic prints captured the different colors found in this dining room area. I like round tables, especially in this small space. It helps the energy flow around the area and creates a convivial atmosphere during meal times. Dagny also opted for a partially closed cabinet and a bar cart as storage for the area. Look at the video to see how Dagny put together the dining room vignette. Paula had in mind a young, female, adventurous, creative spirit when she designed the living room vignette. Like Tom she chose Woodlands and Stone for her walls. Pink and purple graphic art looked good on the grey wall. Hints of fuschia and red on some of the artworks on the left green wall tied the look together. Although the living room was compact, there were two sofas offering ample seating. A side table doubled as a storage place. Two nesting tables in light wood could be moved around very easily if required. Paula used print-on-print in the rugs, sofa and cushion covers. Let Paula show you the living room she designed. Boysen has thousands of colors to choose from. 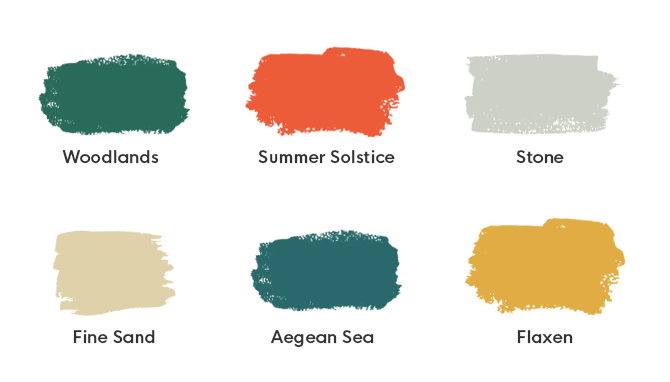 We’ve got the Color Trend palettes. 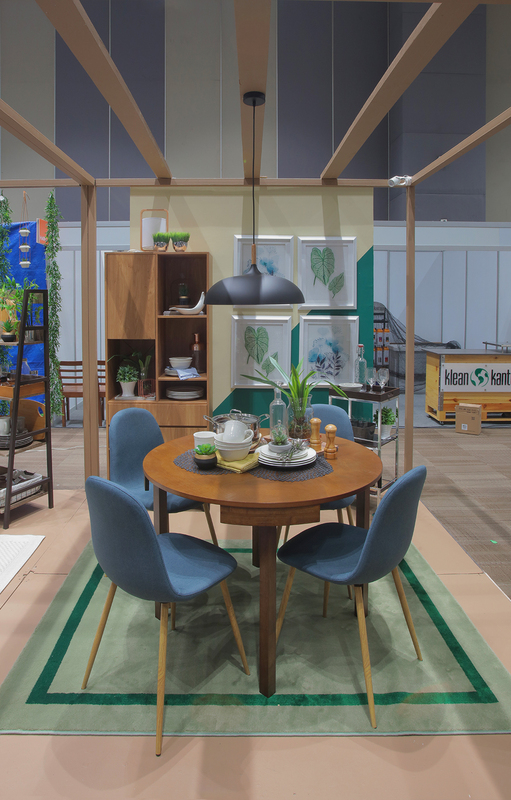 However, if you are feeling bold enough to make your own palette, you can always go to the Mix & Match station in a home depot close to you and explore what colors appeal to you.